"This is Dorrie. She is a witch. A little witch. Her hat is always on crooked and her stockings never match. "Sometime after Ezra Jack Keats and before Carolyn Haywood, I fell in love with Patricia Coombs and her Dorrie books. This one and Dorrie and the Weather Box were my two favorites and I checked them out of the library over and over again. With her messy appearance and bedroom, Dorrie was my kindred spirit. I loved her faithful friend, the lanky black cat named Gink, and enjoyed the poetic repetition of sentences such as, "Down, down, down the stairs went Dorrie. And Gink went with her. "Coombs' illustrations are equally responsible for the charm of this series. Each book has its own palette and, with Blue Witch, Coombs strikes a menacing tone using powder blue and mustard yellow. Coombs' effective use of blue and yellow might be one of the reasons why Blue Witch has always been a favorite. That and the cookies and milk:"'I'm hungry,' said Dorrie. 'I'll just finish my milk and cookies first.'" Loved this book, and so did L! Glad we read it to prepare for Halloween! Dorrie and the Blue Witch is one of those picture books where illustration is everything. The story isn't profound or literary or life changing - although it's quite solid and good - I've read it aloud successfully to a group of third graders at Halloween time. But the book is really about the classic illustrations. My original copy, a paperback from the 1960s which originally probably belonged to my mother, was done up in black and blue ink; the library copy I recently read was in yellow, black and blue. Dorrie is the perfectly illustrated, and whenever I think of the word "witch" I actually picture Dorrie - black pointed hat, strange shoes, striped (blue!) socks. Her black cat Gink is a perfectly illustrated blacker than black cat; the blue witch, Dorrie's mother, Mildred the cook - perfect, perfect, perfect. As someone who loved stories about witches and still loves a good story about a witch, Dorrie is the tops. She's got that black magic. It’s a crime that the Dorrie books are out of print. The three I’ve read so far will enchant modern children just as much as they did those who were children when these books were first published. These feel like must read books to me. They just have to come back into print!I’m always so impressed with authors who can illustrate their own books. The illustrations in this book are truly special and on every page they flawlessly match the story. The story is a lot of fun, a bit scary but only for a short while. Dorrie and her cat Gink are memorable and lovable characters. I love the humor and sweetness these Dorrie stories have. I love how little Dorrie manages to solve the problem of the big blue witch. Young children will really identify with and appreciate Dorrie.I got this through inter-library loan and there’s a sticker inside (for the patrons of the library that owns it) that says “Halloween Book – 7 Day Loan September through October.” I was able to borrow it for the full normal 3 week loan period. Yes, this (along with all the little witch Dorrie books) would be fun to read for Halloween, but will be equally entertaining year round. Charming! The Dorrie the witch series was one of my favorites as a child. I loved reading about the adventures of Dorrie and her black cat, Gink. You could say I've had a thing for the fantasy genre since I first learned to read! OMG I have looked for this book everywhere, I read it soooo many times as a child in grammar school, it was on always on my library card! One of THE best children's books I have ever read! I love it! I read it several times during every year. :) All of the Dorrie books are excellent and worth having on your shelf. This is one of my mother's favourite books, I remember that she read it to me one time. This Dorrie book follows the standard formula for her miadventures. No one listens to her, her mother is too busy and uninterested in her child, and through her largely solo efforts she “fixes” everything.But the solution in this one is a bit different. She basically kills the Blue Witch because she was bossy and annoying. She doesn’t blink, hesitate, or have second thoughts as the annoying, bossy witch shrinks down to a dot. She wishes she had fly spray to “keep her still”... FOREVER. Fly spray isn’t a fly sedative. IT IS POISON! She settles for perfume, pops the witch into a bottle and stoppers it. The clock starts. How much air is in there and how fast is the angry, yelling witch going to consume it? Dorrie doesn’t GAF. She pops the bottle into the piano and goes about her day. Cold. As. Ice. “This is Dorrie. She is a witch. A little witch. Her hat is always on crooked and her stockings never match.”Thus begins each book in Patricia Coombs’ magical series about Dorrie, the little witch. These were my favorite books when I was a little girl. I checked them out over and over from the Richardson Public library—in fact, I can still remember the exact location of the shelf that housed them. Being born on Halloween, I considered myself a little witch too, and I loved Dorrie. I also loved her mother, the Big Witch, who was both stern and loving, and I loved their house with the loooong staircase up to the tower where the Big Witch made her magic, and I loved the way Dorrie always seemed to accidentally get herself into trouble and then, usually, also get herself out, and, most of all, I loved Dorrie’s black cat, Gink, who always followed her up, up, up the stairs and into whatever trouble she was getting into at the time. Gink didn't talk, but Patricia Coombs, who also illustrated the books, did a wonderful job of capturing his feline expressions. I loved Gink so much that I named my own black cat after him. :)Although I love them all, Dorrie and the Blue Witch is my favorite of the twenty books in the series. In this story, Dorrie accidentally lets a very powerful and very evil witch into her house while her mother is away. Dorrie’s smart though, and uses shrinking powder on the nasty old witch to reduce her to the size of a bug. Then she does the same thing I do with scorpions—she traps the blue witch in a bottle until her mother comes home.Unfortunately, these adorable picture books are out of print and a little difficult to find these days, but used copies can still be obtained here and there. If you ever find one at a reasonable price, grab it. You won’t be sorry. This book was brought to mind by another author's recent blog post regarding favorite children's books. My mom read to me constantly as a child, well before I could read on my own, and we made multiple trips to the library every week. 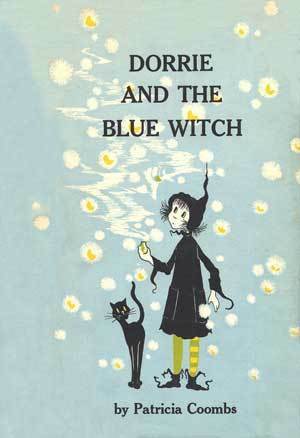 I loved the entire Dorrie series, but Dorrie and the Blue Witch was my favorite by far. This is a fabulous children's book, and all of the Dorrie stories have good messages for kids. Dorrie is a loveable little witch, with a penchant for getting into mischief. In this book, it's up to Dorrie to save the day! This was the first Dorrie book i picked up, and was the one that got me hunting for any other Dorrie books I could get my hands on. The blue witch is pretty creepy, considering the target audience for the book is 1st-3rd graders. I loved it. This was one of my favorite books as a child. I can't remember how many times I checked this out of the library. LOVED this story growing up. I forced my grandmother to read it to me over and over again. She still jokes that she can recite the book to this day :)Good old days! I remember going to the library when I was a kid and checking out every Dorrie book out that I could find. I loved them! The "Dorrie the Witch" books are my FAVORITE books from my childhood. They are small illustrated books, but actually have quite a few words per page. If you've never read one, they are fun! It was a favorite of mine growing up. I would read it over and over. I loved these books!!! I went in search of them recently for my daughter and had a hard time locating them. Love Dorrie! I'm adding a single Dorrie to represent the whole excellent series. These adventure stories are charming (as long as you don't have to read them aloud, which takes too long). Loved it as a child and still do. Such a cute series. Love it! !